Health experts Dr. Susan E. Brown and Larry Trivieri have created a complete resource for people who want to follow a balanced pH diet while also widening their food choices. 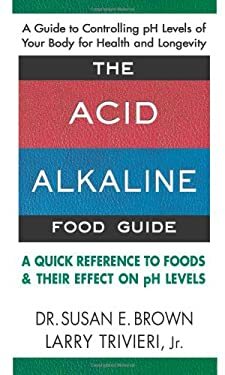 The Acid-Alkaline Food Guide offers dieters an easy-to-follow guide to the most common foods that influence the body's pH levels. The book begins by explaining how the acid/alkaline environment of the body is influenced by foods. It then presents a list of thousands of foods and their acid/alkaline effects--effects that, in many cases, are surprising. Included are informative insets that can assist you in choosing foods that are right for you. The first book of its kind, The Acid-Alkaline Food Guide will quickly become the resource you turn to at home, in restaurants, and whenever you want to select a food that can help you reach your health and dietary goals. Used Very Good (4 available) Great condition for a used book! Minimal wear. 100% Money Back Guarantee. Shipped to over one million happy customers. Your purchase benefits world literacy!